Objectives To determine the efficacy of intra-articular corticosteroid injections for osteoarthritis of the knee and to identify numbers needed to treat. Data sources Cochrane controlled trials register, Medline (1966 to 2003), Embase (1980 to 2003), hand searches, and contact with authors. Inclusion criteria Randomised controlled trial in which the efficacy of intra-articular corticosteroid injections for osteoarthritis of the knee could be ascertained. Results In high quality studies, the pooled relative risk for improvement in symptoms of osteoarthritis of the knee at 16-24 weeks after intra-articular corticosteroid injections was 2.09 (95% confidence interval 1.2 to 3.7) and the number needed to treat was 4.4. The pooled relative risk for improvement up to two weeks after injections was 1.66 (1.37 to 2.0). The numbers needed to treat to get one improvement in the statistically significant studies was 1.3 to 3.5 patients. Conclusion Evidence supports short term (up to two weeks) improvement in symptoms of osteoarthritis of the knee after intra-articular corticosteroid injection. Significant improvement was also shown in the only methodologically sound studies addressing longer term response (16-24 weeks). A dose equivalent to 50 mg of prednisone may be needed to show benefit at 16-24 weeks. Knee pain is relatively common. Around a quarter of people aged 55 years or more in the United Kingdom and the Netherlands have persistent pain, and one in six will consult their general practitioner.1 Osteoarthritis is the single most common cause of disability in older adults, with 10% of patients aged 55 or more having painful disabling osteoarthritis of the knee, a quarter of whom are severely disabled.1 With no cure (excluding joint replacement), treatment is directed at pain relief and improvement or maintenance of function. Intra-articular injection of steroid is a common treatment for osteoarthritis of the knee. Clinical evidence suggests that benefit is short lived, usually one to four weeks.2 The short term effect of steroids shown by controlled trials and clinical experience vary, however, with some patients seen by rheumatologists achieving a significant and sustained response beyond a few weeks. This may be explained by only one injection usually being given in clinical trials and at a lower dose (20 mg) than the 40 mg triamcinolone recommended by the American College of Rheumatologists.3 Pain scores may also be an insensitive outcome measure. Three papers have reviewed the general management of osteoarthritis of the knee, one specifically on corticosteroid injections, but no meta-analysis has been undertaken.1 4–6 We therefore performed a meta-analysis to determine whether intra-articular injections of corticosteroid are more efficacious than placebo in improving the symptoms of osteoarthritis of the knee. We searched the Cochrane controlled trials register, Medline (1966 to 2003), and Embase (1980 to 2003) using the MeSH terms triamcinolone; prednisolone; prednisone; hydrocortisone; adrenal cortex hormones; osteoarthritis; knee; injections, intra-articular; and randomized controlled trial, and the non-MeSH terms injections; randomised controlled trial; and corticosteroid and steroid. Authors of included studies were contacted for details of any further work. The reference lists were scrutinised for relevant papers. Ten trials met the inclusion criteria (fig 1).2 7–12 17–19 An additional paper examined intra-articular corticosteroid injections postoperatively, but we did not consider this paper in the review.20 Table 1 shows the quality scores of the included studies, and table 2 summarises details of the studies and improvements attained. Neither of the two high quality studies were statistically significant for improvement at 16 to 24 weeks, but the pooled result gave a relative risk of 2.09 (1.20 to 3.65) with a number needed to treat of 4.4 based on this result (fig 3). Significant heterogeneity was found when the one low quality study was included. The result was non-significant by random effects analysis. Figure 4 shows the results of pooling the 100 mm visual analogue scale for five studies. When standard deviations were not reported, we assigned a value of 30, as this was the highest reported value and was taken as a conservative estimate. This result is statistically significant. We found no results for pain 16 weeks after injection. 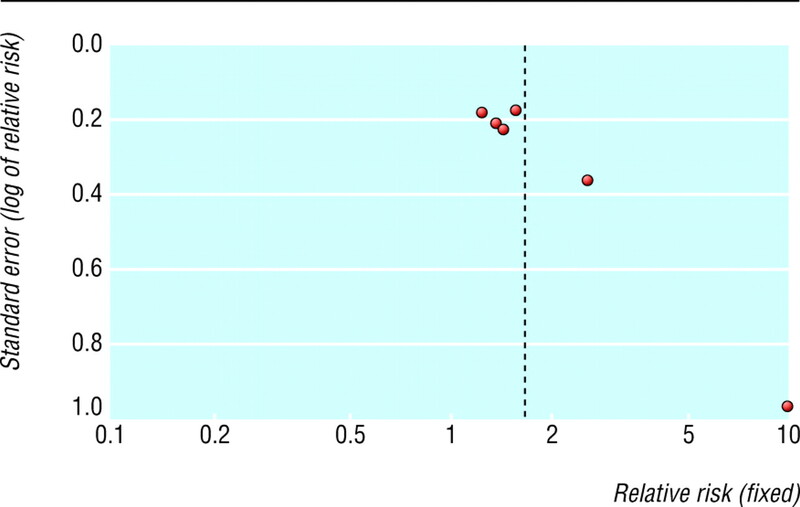 A funnel plot of the six studies suggested that there was an absence of small studies with small effects (fig 5). The smallest study had 12 patients and the largest 71. A similar result was found for improvement up to two weeks for the high dose studies. The effect at 16 to 24 weeks for these studies was the same as the two high quality studies. It was not possible to make a definitive analysis of the clinical conditions of the knee. The patients seemed to have mainly mild to moderate osteoarthritis. The dose equivalent to prednisone varied from 6.25 mg to 80 mg.
Intra-articular injections of corticosteroid improve symptoms of osteoarthritis of the knee. Effects were beneficial up to two weeks and at 16 to 24 weeks. This is the first meta-analysis on this topic and the first review to show benefits of such injections in improvement of symptoms, which may extend beyond 16 weeks. We also report clinically significant numbers needed to treat, ranging between 1.3 and 3.5 patients. The one study that investigated potential loss of joint space found no difference between corticosteroid and placebo up to two years.2 This study also used a higher dose of triamcinolone (40 mg) than most of the other studies (20 mg) and gave repeated injections (every three months for two years). One limitation of our review is possible publication bias, in that by missing unpublished trials or those that showed negative effects we may have overestimated the benefits of corticosteroid injections. We believe, however, that our comprehensive, systematic search strategy enabled us to identify most research in this discipline. Another limitation of our study was the small size of the included studies. Unlike other reviews we report improvement in symptoms, as we believe this is a more important patient oriented outcome than increases in range of movement or pain reduction.21 Only the review by Pendleton and coworkers attempted to pool the results of papers, but they did not perform a meta-analysis, rather they reported the number of studies that showed benefits compared with those that did not and a median effect size.5 Apart from the fact that other reviewers did not pool their data, we had the benefit of access to an article that was in press.12 When this was added to the other two studies, the pooled result was statistically significant for the two high quality studies.12 Larger studies are needed to confirm these findings. The dose of corticosteroid required to improve symptoms is not clear from our review. The equivalent dose of prednisone varied from 6.25 mg to 80 mg.12 19 A dose of 20 mg triamcinolone (equivalent to 25 mg of prednisone) seems to be efficacious for pain control at two weeks. Only one study used 40 mg triamcinolone, and this found a benefit at 24 months for night pain and stiffness on one scale but not on another.2 This study also gave repeated injections and monitored loss of joint space (reporting no difference). The three studies that reported improvement at 16 weeks used different cortisones. The two studies using high doses showed a statistically significant difference suggesting that higher dose steroids may give a longer benefit.2 12 It is not clear to whom the results of this study would apply.11 12 All the studies were done in hospital settings. Evidence supports short term (up to two weeks) improvement of symptoms from intra-articular corticosteroid injection for osteoarthritis of the knee, and the only methodologically-sound studies addressing longer term response (16-24 weeks) also show significant improvement. Doses of 50 mg equivalent of prednisone may be needed to obtain benefits at 16 to 24 weeks. Corticosteroid injection in addition to lavage needs further investigation. Currently no evidence supports the promotion of disease progression by steroid injections. Repeat injections seem to be safe over two years but needs confirmation from other studies. Contributors BA and FG-S were involved in extracting the data, appraising the article, and writing the paper. BA did the mathematical pooling; he will act as guarantor for the paper. The guarantor accepts full responsibility for the conduct of the study, had access to the data, and controlled the decision to publish.
. Knee pain and osteoarthritis in older adults: a review of community burden and current use of primary health care. Ann Rheum Dis 2001; 60: 91–7.
. Safety and efficacy of long-term intraarticular steroid injections in osteoarthritis of the knee. Arth Rheum 2003; 48: 370–7.
. Recommendations for the medical management of osteoarthritis of the hip and knee. Arth Rheum 2000; 43: 1905–15.
. Injections in the treatment of osteoarthritis. Best Pract Res Clin Rehumatol 2001; 15: 609–26.
. EULAR recommendations for the management of knee osteoarthritis: report of a task force of the Standing Committee for International Clinical Studies Including Therapeutic Trials (ESCISIT). Ann Rheum Dis 2000; 59: 936–44.
. A French controlled multicenter study of intraarticular orgotein versus intraarticular corticosteroids in the treatment of knee osteoarthritis: a one-year follow up. J Rheumatol Suppl 1991; 27: 134–7.
. Intraarticular prednisolone injection for osteoarthritis of the knee. A double blind test with placebo. Acta Chir Scand 1966; 132: 532–7.
. Intra-articular steroids in osteoarthritis. Rheumatol Rehabil 1980; 19: 212–7.
. The efficacy of intraarticular steroids in osteoarthritis: a double-blind study. J Rheumatol 1980; 7: 850–6.
. Intra-articular triamcinolone hexacetonide in knee osteoarthritis: factors influencing the clinical response. Ann Rheum Dis 1995; 54: 379–81.
. 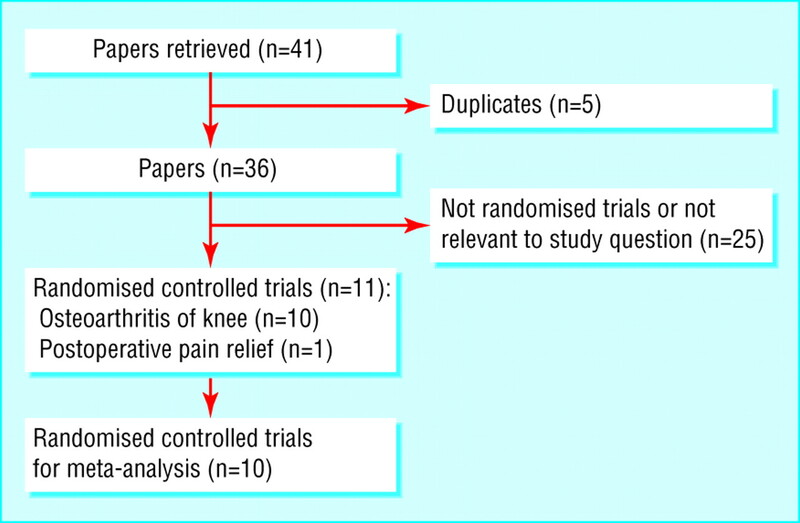 Effects of joint lavage and steroid injection in patients with osteoarthritis of the knee: results of a multicenter, randomized, controlled trial. Arth Rheum 1999; 42: 475–82.
. A randomized placebo-controlled trial of arthroscopic lavage versus lavage plus intra-articular corticosteroids in the management of symptomatic osteoarthritis of the knee. 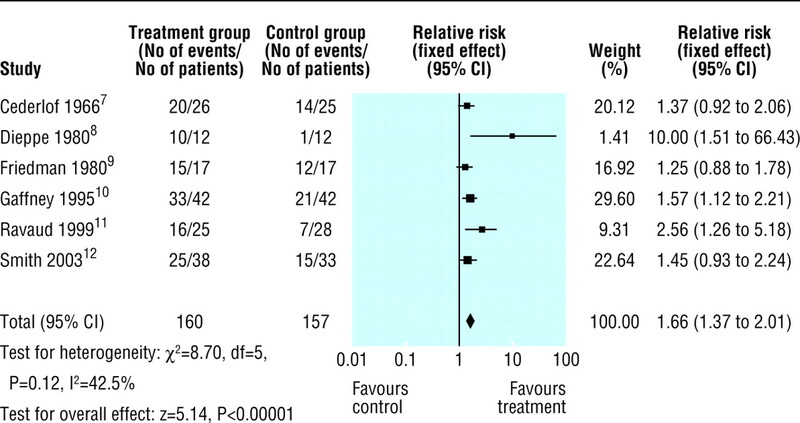 Rheumatol 2003; 42: 1477–85.
. Interpreting treatment effects in randomised trials. BMJ 1998; 316: 690–3.
. Assessing the quality of reports on randomised clinical trials: is blinding necessary? Control Clin Trials 1996; 17: 1–12.
. The science and therapy of glucocorticoid-induced bone loss. Endocrinol Metab Clin North Am 1998; 27: 465–83.
. Improving the quality of reports of meta-analyses of randomized controlled trials: the QUOROM statement. Quality of reporting of meta-analyses. Lancet 1999; 354: 1896–900.
. Intra-articular corticosteroids are effective in osteoarthritis but there are no clinical predictors of response. Ann Rheum Dis 1996; 55: 829–32.
. The value of intra-articular injections in osteoarthritis of the knee. J Bone Joint Surg 1958; 4013: 636–43.
. Intra-articular therapy in osteoarthritis. Comparison of hydrocortisone acetate and hydrocortisone teriary-butylacetate. Ann Rheum Dis 1960; 19: 257–61.
. Intraarticular triamcinolone acetonide for pain control after arthroscopic knee surgery. Anesth Analgesia 1998; 87: 1113–6.
. Measuring clinically important changes with patient-oriented questionnaires. Med Care 2002; 40: II45–51.